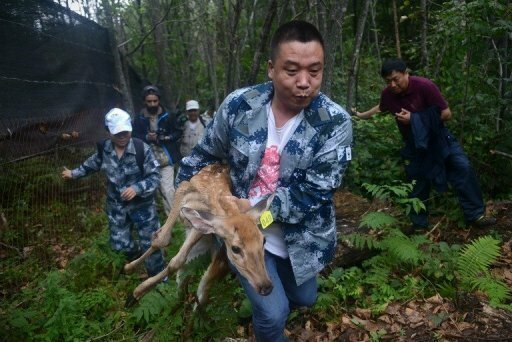 A World Wildlife Fund worker carries an injured sika deer, which will be served as food for Amur tigers, in the Jilin Wangqing National Nature Reserve in China on August 26, 2013. WANGQING, China (AFP) – (AFP) – High in the mountains of northeastern China, conservationists looking to preserve the endangered Amur tiger — the world’s largest living feline — are releasing deer into the area for the big cats to kill and eat. Historically, China’s shamanistic Manchu people both revered and hunted tigers, with the Qing dynasty Kangxi emperor claiming to have killed 135 with bow and musket, according to Peter Dekker, an independent researcher of Qing dynasty weapons. China was once home to several tiger subspecies, but now their legacy endures more in folklore — “Where there are mountains, there are tigers,” goes one old saying — than in the flesh. Conservationists cite increased human settlement, logging and poaching of both tigers — for use in Chinese medicine — and prey as among reasons for the dramatic population fall. “The prey numbers are very low in comparison to other countries,” said Rohit Singh of global conservation organisation WWF’s Tigers Alive Initiative. WWF has a project to increase deer numbers in the Jilin Wangqing National Nature Reserve in an effort to give the tigers — and even more endangered Amur leopards — a chance to thrive and multiply. But the tigers’ appetite is huge. Dale Miquelle, Vladivostok-based director of the Wildlife Conservation Society’s (WCS) Russia Program, said one tiger needs to kill about 50 deer or wild boar a year to survive, and a prey population about 10 times that size was needed for the kill rate to be sustainable. “Whether it be red deer or sika deer or wild boar, you need a relatively large number of animals,” he said by phone from Russia, home to a far bigger Amur tiger population estimated at about 350-400. “Ultimately the process will be about making sure that these (prey) animals are protected from poaching and that they have the area to expand their populations and that their habitat isn’t being destroyed by other activities,” he said. The corridor is “very important for tigers,” said Tang Lijun, deputy director of the reserve’s administration bureau, adding steps had been taken to sharply reduce logging work in the area to help preserve it. The last time a WWF camera trap caught an image of a tiger was in April 2012, but Miquelle said devices in China’s Hunchun Nature Reserve, part of the “corridor” and where WCS has a programme, had yielded views of at least four different tigers this year. Footage collected by WWF last month showed an adult male Amur leopard, scientific name Panthera pardus orientalis and the world’s most endangered feline, walking through the Wangqing reserve forest, stopping to emit a sizeable yawn before stepping over a fallen tree limb and heading out of view. As recently as the 1970s Amur tiger numbers in China and Russia were about equal at approximately 150 each, Vattakaven said, but the Russian population rose “because of protection and other efforts”. Joe Walston, Asia executive director for WCS, added from New York: “If it hadn’t been for Russia there now would be no wild tigers in China. A key factor, he added, was that China should avoid major infrastructure projects “that will divide and break up tiger habitats”. Dekker, who is based in Amsterdam, said that for the Manchu — who ruled China from 1644 to 1911 — tigers were a worthy foe and to be fought with spears rather than bow and arrow. “Manchu men were expected to show their manliness by facing animals in the wild, preferably beating them in their own game,” he said via e-mail — although emperors would also use bows or firearms in casual hunts. The WWF’s Singh said that while there were important ecological reasons to save tigers, they paled before one compelling fact.